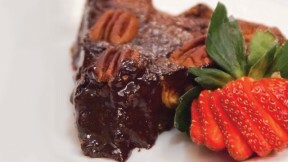 This is a delightfully delicious and decadent dessert packed with the goodness of dates, dark chocolate, tender pecans and a touch of pure maple syrup. To make the crust, put the dates, oats, coconut, and pecans in a high-performance blending appliance, and process to the consistency of soft dough. Transfer the dough onto a board and form it into a ball. Flatten the dough slightly with your hands and then use a rolling pin to roll the dough into a 10- inch round. Invert the dough on to an ungreased 9-inch pie plate. Press the dough mixture evenly over the bottom of the plate, pushing it up the sides of the pie plate as you go, to make a crust. To craft a pretty edge to the crust, use your index finger to push the inner edge of the crust out, while pinching the outer edge in with the thumb and index finger of your other hand to make a classic scallop edge around the pie crust. To make the filling, put the maple syrup, molasses, vegan chocolate chips, pitted dates, vegan margarine, water, and vanilla extract in a blender and process until very smooth. Pour the maple mixture in a medium bowl. Fold in 1½ cups pecan halves. Pour the filling into the crust and smooth the top using a rubber spatula. Gently press 15 pecans halves into the top of the pie, arranging them in a pleasing manner. Put the pie on a baking sheet and bake for 25 to 30 minutes, or until the edges start to set and brown. Tent the pie with foil and bake for 5 to 8 minutes more, or until the pie has almost set in the middle. The filling will still be somewhat soft.